Uriah Heep are one of the most well known Hard and Progressive Rock bands of all time. With a tremendous back catalogue of 24 studio albums, they tour relentlessly to the delight of thousands of fans worldwide. 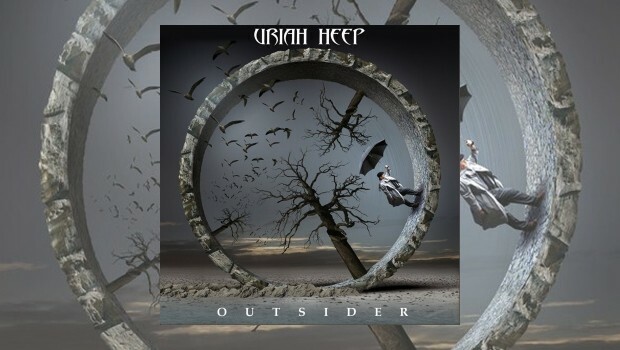 Following on from 2011’s Into The Wild, Uriah Heep’s latest album Outsider is the first studio release to feature Davey Rimmer on bass guitar and the fourth with Russell Gilbrook on drums. The album is once again produced by Mike Paxman who arrived on 2008’s Wake The Sleeper record and has worked on the last four studio albums for the band along with the odd live album. The album begins with Speed of Sound and for the first 13 seconds you could be forgiven for thinking you have put on Uriah Heep’s Against The Odds from Sea Of Light – the resemblance in keyboard sound may be an accidental allusion but a clear one in any Heep fan’s eyes. Speed of Sound is a steady rock song with strong vocals, thumping bass and should have any listener drumming along. The way this track fades out and synchs into the second track is pure genius, here begins the best keyboard opening I have heard from a band in recent years. One Minute instantly sets a sombre mood which lasts exactly one minute (and three seconds) before the band do a complete u-turn into one of the most upbeat and chorus focused songs on the album. If you own a copy of Into The Wild, this song is the closest thing to Nail On The Head. One track that stands out as a real joy for me is Can’t Take That Away – every member of the band excels on this track. Aside from Bernie Shaw’s crystal clear vocals, a special nod must go to new bass player Davey Rimmer whose sound here carries the track and compliments the extremely prominent keyboards from Phil Lanzon, this one has to be played with the volume turned up to appreciate it to the fullest. Being the first studio album without long-time bassist Trevor Bolder due to his sad passing in May 2013, a lot of expectation will have been placed on this album by fans. There is a section within the album notes entitled “Trevor Bolder” in which the band explain that during the recording process they recalled his spirit and humour to influence how the album was written. Also mentioned is how well Davey has done stepping in to join the band, Davey is no Trevor and he does not need or pretend to be, one only has to play the album to hear just how good the bass sounds. Kiss The Rainbow – now this is a classic Uriah Heep song! The vocal harmonies are addictively present on this track and there is no escape from foot tapping to Russell Gilbrook’s drumming here. It has to be said that Phil Lanzon shines on this album so much, his keyboards here are no exception; about two and a half minutes in is a very gentle and pleasant keyboard solo which builds and opens the way for Mick’s meticulous guitar playing which continues until the last beat of the track, fading out with the vocal harmonies. Say Goodbye is a heavy, thundering track that concludes the album, it is a track that would not be out of place on the bands Wake The Sleeper album and any Heep fan should be able to easily picture Mick Box having lots of fun with this riff on stage. Vocal harmonies throughout the track make you instantly connect with that classic Heep sound, the ever proficient Phil Lanzon once again provides an incredible keyboard solo mid song that cannot be left unmentioned – you have to hear it! The song begins with the lyrics, “I gave you my heart but you sold it online” so I will end my first album review here and say goodbye! 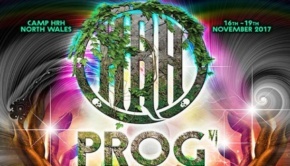 Looking forward to 2015, Uriah Heep are about to release the double live CD plus DVD Live At Koko recorded in London in 2014, which will hopefully capture the energy and genuine happiness that always radiates from a Heep live show. I could not recommend this album more to Prog and Hard Rock fans alike; it is an album you will go back to again and again. It is also, much like the man behind those trademark six-string licks, rock and roll with a great big smile on its face. If you are going to buy this album and fully appreciate it, make sure you PLAY IT LOUD! !